Every nalbinder seems to have his/her own ways of working, and there is not only one 'right' way to do things, so also these videos are only guiding. Please do notice that the movements are slow on purpose, and that due to some difficulties combining suitable light and the position of the video camera, and that I wanted to see my hands both irl and on the small video screen, I had to keep my arms and hands in a bit akward and clumsy position, so the movements may not look 'natural'. Note, for example "Finnish Stitch 1+2" means when you are using thumb loops, that there is one loop around thumb, and two loops are picked up onto the needle. When you are not working withouth thumb loops (flat), that means that the needle goes "under one, over two", ie the needle goes under-over-over - direction of the needle changes - under-under-over-(over). To search this page, use "Control + F". How to start (to make the first loops), joining a chain of stitches to a circle (joining a foundation row to a circle), second row (F1, F2, etc), how to tension stitches onto the needle (make stitches smaller, working with thin yarn), how to make a round start. Voiceover both in English and Finnish. 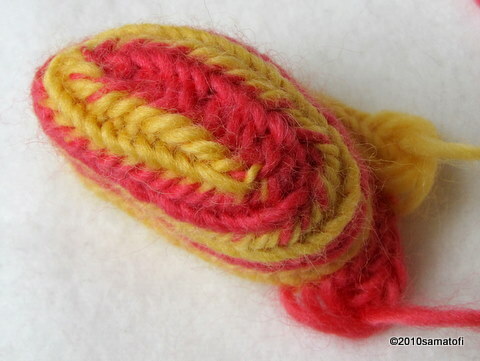 The first stitches into the large starting loop can be made in the way you prefer, and when you have made enough of the stitches, and pulled the large starting loop tight, to a rosette, you can continue with whatever stitch you prefer (ie you don't have to use the stitches shown on the videos). Another way to make a round to mitten, is to make a short chain of stitches (2-3 cm), then pivot like when doing a square top mitten. In this case, though, the increases are done like when doing a round top mitten. You can, of course use any stitch instead of the one shown on the video. The colour change technique shown by Aili Kuronen suits also for example Russian Stitch. The 'waiting' colour is picked up in a similar way as on the videos. Note, that when using Russian Stitch, the shape of the spots will be different when you use thumb loops, compared to the shape when working without thumb loops (flat). In addition, when working without thumb loops (flat), the shape of the spots will be different when you insert the needle through all the loops, and then pull the needle and yarn through, compared to the shape when you first insert the needle 'half-way' (under-over-under), pull the needle and yarn through, and then finish the stitch by inserting the needle over-under-over, and then again pull the needle and yarn through. Depending on the stitch, make 1-3 additional stitches at the end of each row before turning the work. You can either make the additional stitches into the last loop of the previous row, or make 'air stitches', ie don't connect them to the previous row (just like when doing the very first row of stitches). To make loopy fringes for a scarf, you can make at the end of each row a longer chain of stitches ('air stitches') before turning the work. When working with stitch types which don't involve several stitches, for instance Finnish Stitch 1+1 (Oslo Stitch), Finnish Stitch 1+2 (Mammen Stitch), and Russian Stitch 1+1+1 (Dalby Stitch), it may be necessary to pull the new stitches smaller, especially if the yarn is thin, in order to get the structure look like the way you want. Pulling the stitches smaller, or tensioning them onto the needle, gives you smaller gauge and denser structure. Outside Finland, many of the stitches are known by the name of the place of a historical find, or by the name of a village or area. Such names are included in the parenthesis. - When working in Aili's way, the stitches can be pulled smaller. 1 (video) - How to make mittens cuff up, Part 1/2. First loops, joining a chain of stitches (foundation row) to a circle. 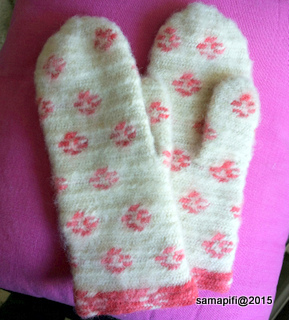 2 (video) - How to make mittens cuff up, Part 2/2. How to connect the new stitches to the previous row (F1, F2, etc), different ways. Making thumb opening. Decreasing at the mitten top, round and square tops (when you are making mittens cuff up). 3 (video) - How to make thumb. Beginning, corners, finishing. 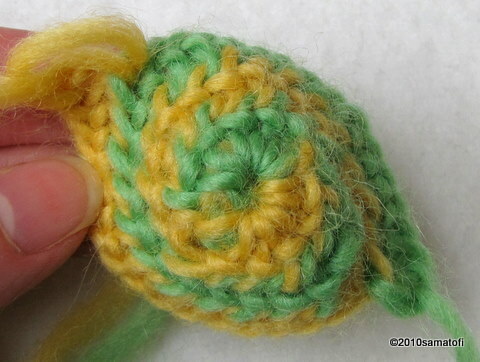 4 (video) - The placement of the thumb in a square top mitten. Note, if your mitten has quite a few more loops on the bottom half (thumb-wrist) than in the upper half (thumb-top), the twisting shown on the video won't happen. 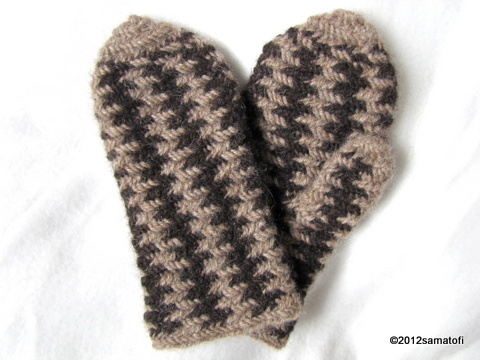 On the other hand, if you wish your mitten width to be equal, have a look at the twisting shown on the video. 5 (video) - Increasing and Decreasing. 6 (video) - How to make mittens top down. Square top. Pivoting, increasing. 7 (video) - How to finish off the edge. In addition, if your mittens were made cuff up, how to undo the point where the mittes were started, and then finish off. The unwanted gaps at the root of the thumb. Note, some of the 'darning' stitches can be done on the reverse side, so that the gaps will get closed, but the additional darning stitches won't be too visible on the right side. 8 (video) - How to make mittes top down. Round start. Increasing. 9 (video) - How to adjust gauge, size of stitches. Sometimes it may be necessary to adjust your gauge to fit the yarn and the stitch type, in order to get the finished item look like the way you want it. 10 (video) - Different ways to handle the thumb loops. Note, you can use the same technique of making spots also for making vertical stripes.